2019 is set to be the toughest year yet for the long-running White Rose Classic. 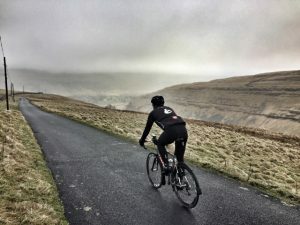 The Hawes Long Route is 120 miles long, featuring 6 “named” climbs with a total elevation gain of over 10,000 feet. Anyone planning on tackling this considerable challenge needs to be prepared, not just for the hills we have given names to, but all those in between as well. With this in mind, we asked some advice from Andy Cunningham – ICC member, nationally-rated hill climb specialist, and fastest male time around the Etape du Loch Ness for two years running – about how he plans to tackle the peaks and troughs of this year’s White Rose Classic. When can you finally stop conserving energy and put the power down? What’s unexpected about the White Rose Classic? Any recommendations for Settle Medium Route riders?